0.5" or 0.75" or 1.0" thick pads of engineered impact protection to cushion your skull from impact. Many other helmets look the same on the outside, but have the older generation nylon / leather / open cell foam interior suspension - NOT up to modern standards. If it says "universal fit", "comfort fit" or "standard fit", or other than ACH blunt trauma protection pads, you are missing critical protection for your brain. These older systems can be fine on comfort, but offer MUCH less blunt trauma protection on impact. Tested by an independent ISO-certified laboratory to exceed the blunt trauma protection standard of the ACH (Advanced Combat Helmet). Significantly exceeds the blunt trauma protection standard. ULTRA-LIGHT - only 2.6 lbs. before Accessories! 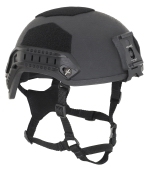 A great upgrade to snug the helmet onto your head if carrying heavy NV equipment. ...or you can easily spray paint. So, before adjusting the chinstrap, experiment with different pad configurations inside the helmet. at a shoe repair or upholstery shop, you could add another grommet to tighten the chinstrap even further. You can do it yourself on the rear 2 straps just by folding the grommets over on the stap to tighten it up about an inch, and burning a new hole through the grommet with a soldering iron (so you don't have to add a new metal grommet).